Bob ‘The General’ Knight stopped in at the Millville Volunteer Fire Company to voice his support of Rob Arlett. 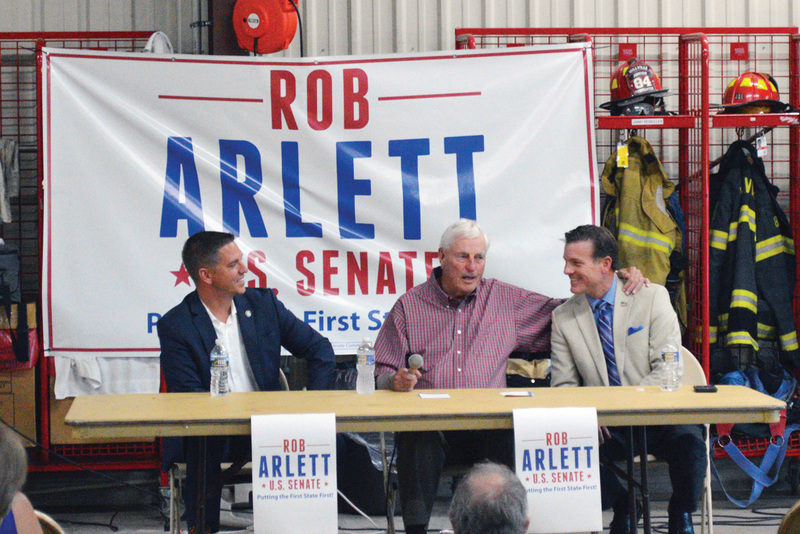 Former Army, Indiana University and Texas Tech floor boss Bob “The General” Knight spoke to a large contingent of Arlett supporters inside the Millville Volunteer Fire Company engine room. Knight was there to show his support for Arlett, as well as President Donald J. Trump. “One thing to be sure of, folks — when you’re the man or lady in charge, be in charge,” Knight joked with the crowd prior to embarking on a 45-minute conversation with the local residents. “You’ve got a wonderful state. You’ve got a lot of wonderful people here. You’ve got a lot of Americans, and we need all the Americans we can have. Knight made several jokes throughout the event about his time coaching, including how “whenever I was at Army, we always beat Navy” as a way of having fun with Arlett’s U.S. Navy family. Someone in the crowd responded, “Let’s play football,” which got a loud laugh from group. For Arlett, having a man of Knight’s stature speak on his behalf was a chance he couldn’t turn down. “We have a vision to do good things here in Delaware,” Arlett said. “All of you care about your country. All of you care about Delaware. We are truly honored to have Coach here tonight. He is here just for us, just for you. Arlett will be hosting another Community Town Hall event coming up on Tuesday, July 10, from 6:30 to 8:30 p.m. at the Selbyville Volunteer Fire Company, located at 30 N. Main Street.